A cat stroller is a fun way of getting your cat out of the house without the risk that she will run away. 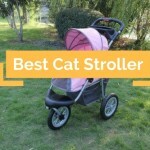 These strollers function like the ones designed for babies but have an enclosed area where the cat is placed. Since cats do not respond well to being put on leashes, a stroller makes it possible for an indoor cat to experience the outdoors safely. There are also many practical reasons why you should use a stroller when you take your cat out for a walk. For example, many cats do not like going to the vet,but if they have are used to getting into the stroller for their afternoon outdoors walks, you can easily take them for their regular checkups without too much fuss. Older cats who already suffer from mobility problems will also enjoy being out on a stroller. When you buying a cat stroller there are a number of considerations to keep in mind to ensure that the model you get will be comfortable for your cat. The main one, of course, is size. The stroller should be large enough for the cat to be able to move around and sit or lie down comfortably. The mesh should be strong enough to withstand the cat’s claws if she decides to play with it. You should also choose one that is easy for you to push around without much effort so that you won’t get fatigued easily. If you want your stroller to be able to double as a bed for your cat, you can also look for one that has a removable mesh covering. This is an extremely comfortable and stylish pet stroller in the classic Euro-Canopy style that both you and your cat will love to take strolls with. It features a large compartment with interior measurements of 26-inches by 12-inches by 19.5-inches and can accommodate pets of up to 45 pounds. 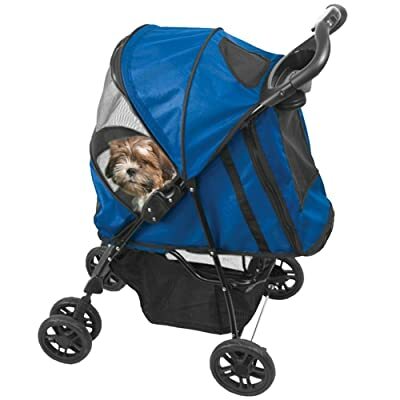 The interior compartment has a plush interior fleece pad to ensure the comfort of your pet while inside the stroller and allows easy access through a zippered opening. The stroller has a height of 38.8-inches measured from the handle. It is available in three attractive colors: sage, blueberry and raspberry. A parent tray and storage basket that conveniently allows you to keep your pet necessities where you can easily reach them when you need them. Easy-fold mechanism can be handled with one hand for easy storage if you have to fold it to put in a car trunk or the back seat. Rear shock absorbers make pushing around the stroller easier without suffering from hand fatigue, while the wheel lock makes it easier for you to navigate rough terrain. The front wheels also swivel when you are using the stroller indoors or on smoother ground. The interior tether provides further security by allowing you to secure the cat inside the stroller. Your cat will love to go for trips outside in the Happy Trails pet stroller, since it has an over sized mesh window that extends to either side, providing your feline friend with a panoramic view of the surroundings. The interior compartment has dimensions of 24-inches by 12-inches by 23-inches and can accommodate pets of up to 30 pounds. It is done in the fashionable Euro-Canopy style and is available in Pink Ice, Sahara and Cobalt Blue. The canopy is made of Denier 600 nylon which is water-resistant so that you can use it during slightly inclement weather. The stroller can easily be folded using one hand in a matter of seconds. This makes it more convenient when you have to fold it to put in the trunk or back seat of your car after you’re finished using it. Allows access to the interior compartment at the front and back, making it easier to get your cat inside and to take her out afterwards. Front swivel wheels and shock absorbers make the stroller ideal for use in a variety of terrains;and as an additional safety feature it also comes with a rear brake. The parent tray features cup holders so that you can easily bring along your favorite drinks while you’re taking your pet out. This pet stroller features 12-inch EVA tires to ensure that you can take your cat for a walk in rough or smooth terrain. The stroller is available in attractive Blue Sky and Red Poppy colors and can accommodate pets of up to sixty pounds with an interior compartment measuring 28-inches by 14-inches by 23-inches and an ergonomically-designed handle to help prevent hand fatigue. The interior has a fleece pad for the comfort of your pet as well as a waterproof tray for food. Easy folding mechanism can be used with one hand for convenient storage when you’re on the good and you need to quickly get the stroller into your car. The stroller has a parent tray with cup holder as well as a storage compartment where you can conveniently keep the supplies that you need easily accessible. The front wheels can either be swiveling or fixed in a stationary position, and the rear wheels have shock absorbers to help reduce user fatigue. 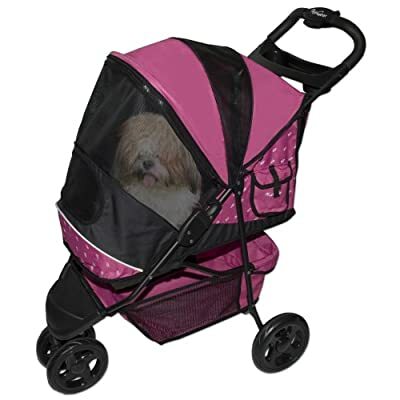 In addition, there is also a quick-locking foot brake in order to ensure the safety of your pet by preventing the stroller from slipping out of control. Interior safety tether allows you to keep your pet secure by preventing him from jumping out while you’re walking. If you’re convinced that you need a cat stroller, the Special Edition Pet Stroller by Pet Gear is a great choice. Pet Gear is one of the most respected brands in the pet supplies industry and produces outstanding products that pet owners have long raved about. 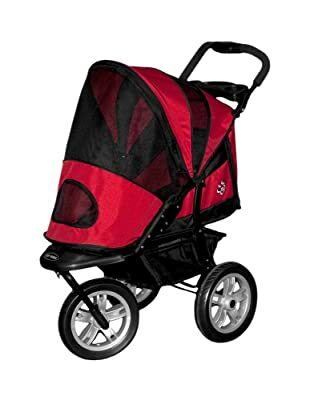 The Special Edition is a good compromise between a higher-end stroller and the lightweight budget strollers, providing you with the versatility to accommodate pets of various weights. 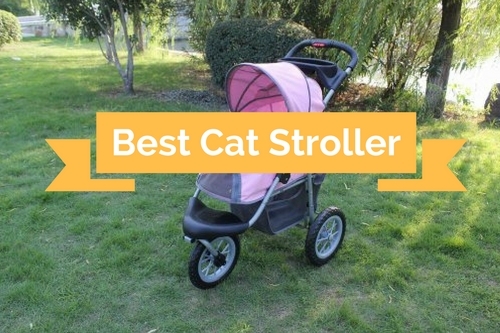 If your cat should gain weight or you want to take a couple of kittens out for a stroll, this stroller will let you do so without the necessity of having to pay for a stroller with extra capacity that you won’t use. And it has a range of user-friendly features that make it more convenient to use. So why not try this stroller out? Your cat will surely love it and you’ll have no more trouble taking him to the vet.